A year ago, Victoria Bryant told her GP she thought her neck needed re-alignment. Within days, an MRI revealed the problem was much more than anyone had imagined - she had a brain tumour. "My uncle had died from a brain tumour at age 17 so obviously I feared the worst." 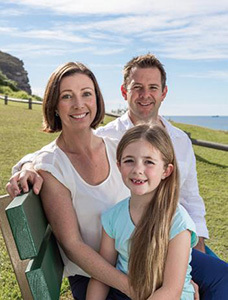 The mother-of-two from Avalon, on Sydney's northern beaches, was referred to Royal Prince Alfred Hospital and diagnosed with a grade 2 astrocytoma, situated in the centre of her brain. She underwent surgery, but was home again within days, without needing chemotherapy or radiation. "I couldn't drive for three months so I bought a bicycle, attached baskets to it and rode all over Avalon getting things done, but I've been very lucky. The cancer was caught early. It could have turned out very differently." The family celebrated by adopting a poodle cross puppy born on the day Victoria had her surgery. "We say we have the same birthday because we started life together."